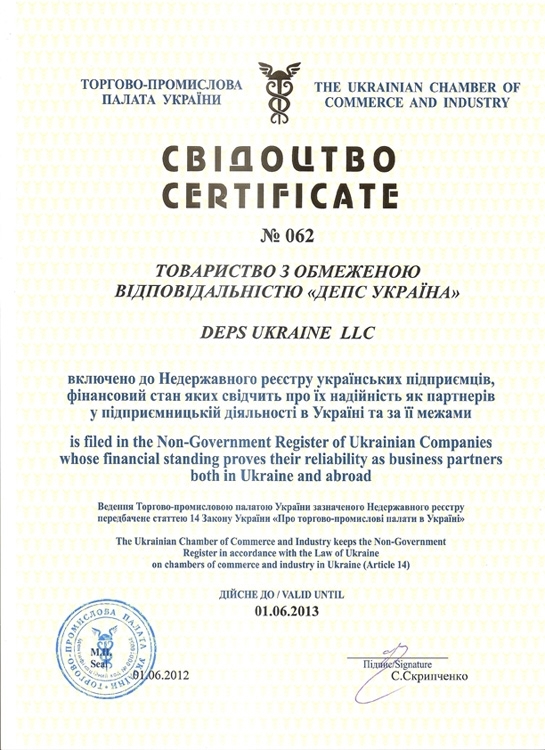 "DEPS Ukraine" received Certificate of Reliable Business Partner and was filed in the Non-Government Register of Ukrainian Companies, whose financial standing proves their reliability as business partners both in Ukraine and abroad (Register of reliable partners). Article 14 of the Law of Ukraine "On the Chambers of Commerce and Industry - in Ukraine" provides the Ukrainian Chamber of Commerce and Industry the right to file Company/Enterprise in the Non-Government Register of Ukrainian Reliable Companies . This fact serves as a company/ enterprise guarantee in dealing with foreign partners, when signing contracts, creating joint ventures, participating in international tenders.